Looking for an stylish and unusual pair of earrings? Look no further! Made using Alpaca metal alloy and silver plated hooks, our range of beautiful Mexican earrings are perfect for completing a look. These complex and distinct earrings have three dangling tear drops. 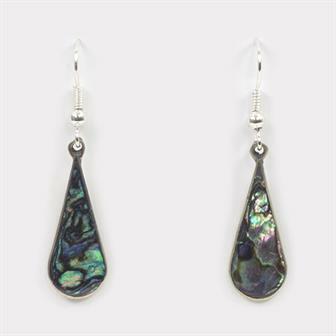 Each earring makes great use of crushed, colourful stones, abalone shell and Alpaca silver. 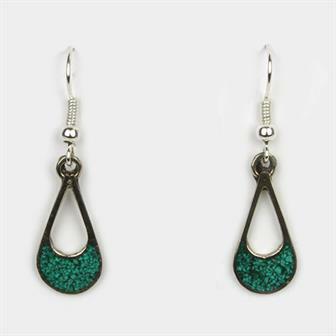 These lovely cutaway tear drop earrings are handmade in the town of Taxco, Mexico. They are made from Alpaca silver metal alloy and are available in a great mix of colours. 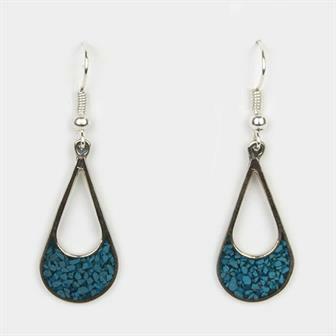 These large cutaway tear drop earrings are handmade in the town of Taxco, Mexico. They are made from Alpaca silver metal alloy and are available in a great mix of colours. 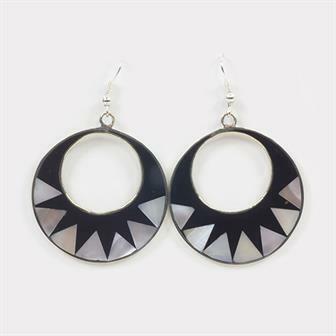 These beautifully angular earrings are handmade in Taxco, Mexico. They use Alpaca silver alloy and mesmerising abalone shell to create a bold and eye-catching item. 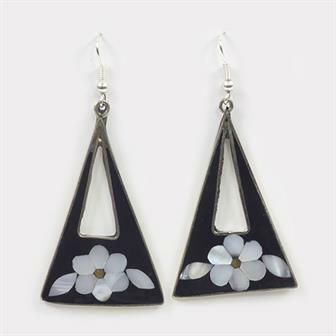 Featuring bold chevrons of white, these wonderful earrings are handmade in the beautiful town of Taxco, Mexico. These charming little earrings are a subtle little item of jewellery. Made in Taxco, Mexico using Alpaca silver alloy. 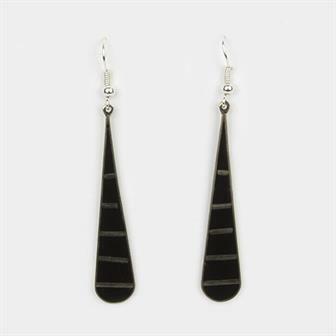 These lovely elongated tear drop earrings are hand made in Taxco, Mexico and feature a simple horizontal stripe pattern. 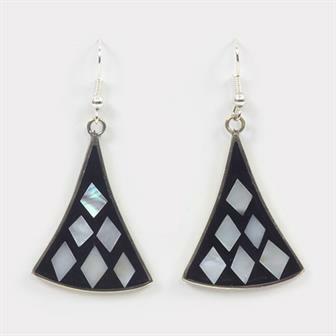 These stretched diamond shape earrings come in a draughts board colour scheme with abalone shell inlay. Each pair is handmade in the picturesque town of Taxco in Mexico. Elegant dew drop shaped Earrings handmade in Mexico using alpaca silver and set with a variety of either crushed minerals or shell. Hung on silver plated hooks. 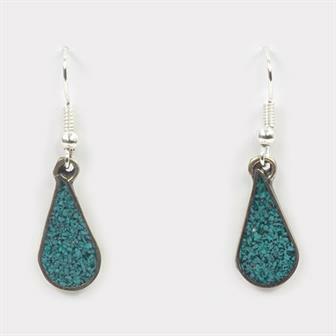 These classic tear drop shaped earrings are handmade in Mexico. Made from a metal alloy known as Alpaca silver, each pair is set with a pearly piece of shell in white or slightly pink tones and given silver plated hooks. 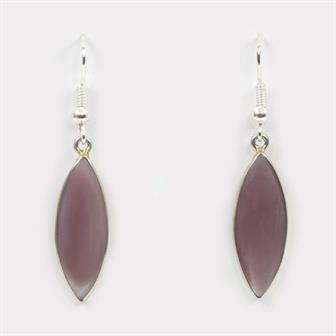 Simple and sweet little handmade Mexican earrings made with wonderfully lustrous pink shell set in an ellipse shape. Made using a metal alloy called Alpaca silver and hung on silver plated hooks. Fleur De Lys shaped earrings from Mexico made with the metal alloy known as Alpaca silver and set with a tear shaped piece of either lustrous pink shell or blue crushed mineral. 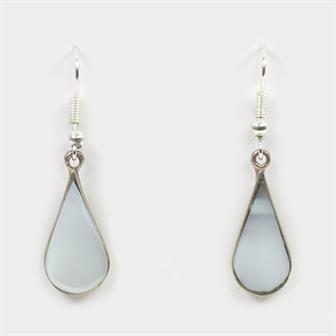 These simple yet elegant earrings are hung on silver plated hooks. 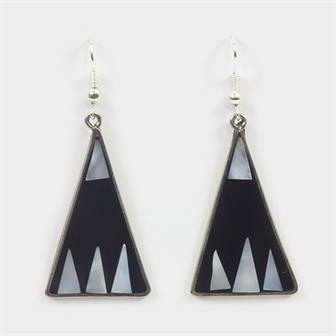 Larger earrings in a striking triangular shape made with a metal alloy known as Alpaca silver. Each pair is set with a lovely detailed floral pattern made from pieces of polished lustrous shell. 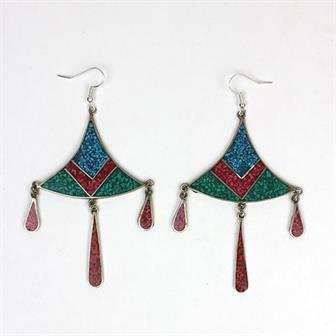 All our Mexican earrings are hung on silver plated hooks. These beautiful round little earrings are made in Taxco, Mexico. 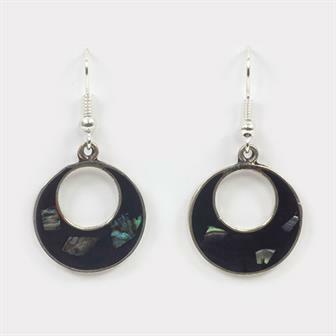 Each pair of these eye catching earrings are made from Alpaca metal alloy and decorated with segments of abalone shell. 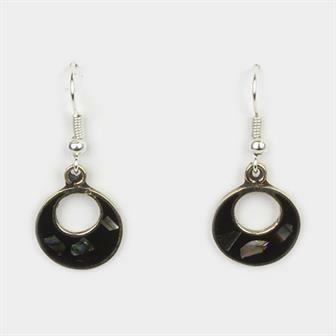 These lovely circular earrings are set with dramatic triangles of pearly pink shell on a rich black background. Each pair is made with the metal alloy known as Alpaca silver and are hung with silver plated hooks. 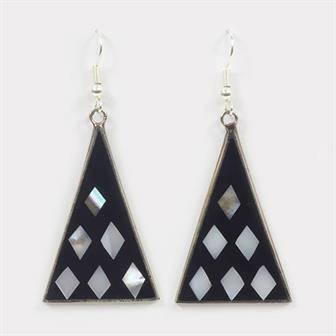 It's all about the angles with these wonderful handmade Mexican triangle earrings. Made with either pearly white shell or patterned abalone, each pair uses the metal alloy known as Alpaca silver. All our Mexican earrings are hung with silver plated hooks. 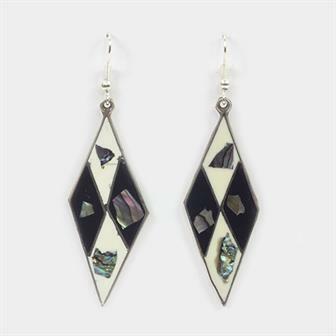 These lovely triangle shaped earrings from Mexico are decorated with abalone shell in a style akin to a harlequin costume. 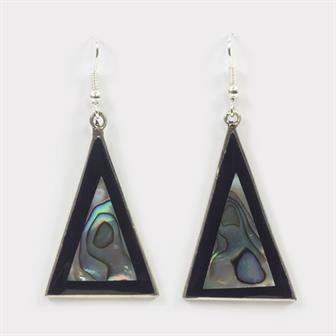 These stylish earrings have an unusual flared triangle shape and use an abalone shell to create an eye-catching harlequin pattern. Each pair is made using Alpaca metal alloy. Our Mexican earrings all have silver plated fixings. 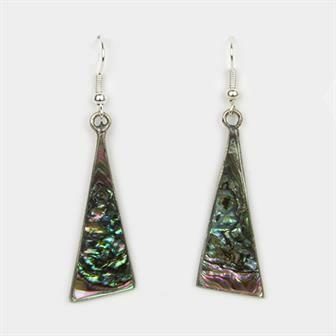 Boldly decorated with a twin triangle design, these Mexican earrings are made with abalone shell and Alpaca metal alloy. 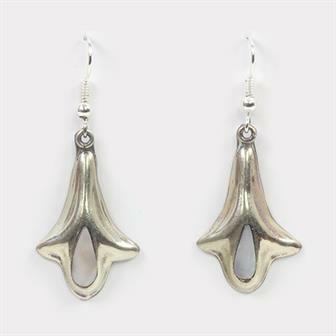 Each pair of our Mexican earrings is hung on silver plated hooks.